It’s summertime. What’s better than enjoying a popsicle on hot day after playing outside? Enjoying a popsicle that you just make in seven minutes, made of fruit that doesn’t contain 47 chemicals or high fructose corn syrup, that’s what. 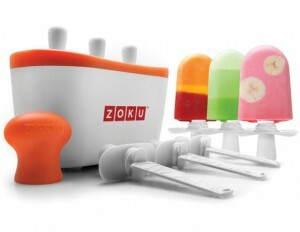 The patented Zoku Quick Pop™ Maker freezes ice pops in as little as seven minutes right on your countertop without electricity. Quickly make striped pops, yogurt pops or (for the first time ever at home) flavored core pops. To enjoy Quick Pops at a moment’s notice, simply store the compact base in your freezer. The kit includes six durable, reusable plastic pop sticks that have unique ridged designs that allow pops to adhere securely, with special drip guards for tidy eating. A specially designed Super Tool helps to quickly release the frozen treats from their molds. The unit can make up to 9 pops before refreezing the unit again. Includes 1 Quick Pop Maker, 6 sticks, 6 drip guards, and 1 Super Tool. We used 100% pure mango puree from Trader Joes (already in frozen packets,) warmed it until pliable, poured it into the mold and…nom. Highly recommended. The kids loved it and they’re able to eat a treat that isn’t junk. * I forgot to mention you can do all sorts of cool things like sliced fruit insertions, “coated” or flavored core pops, striped zebra pops…cool. These things are great!! We have the extra fancy pack with the ramp thingy and pipette thingy that allows you to make multi-coloured and flavoured popsicles! Try wacking some coconut milk and mango juice in there …yummo. Perfect treats for the kids!